Tomato Omelette is a popular Indian breakfast. It’s healthy, eggless, vegan and gluten-free. 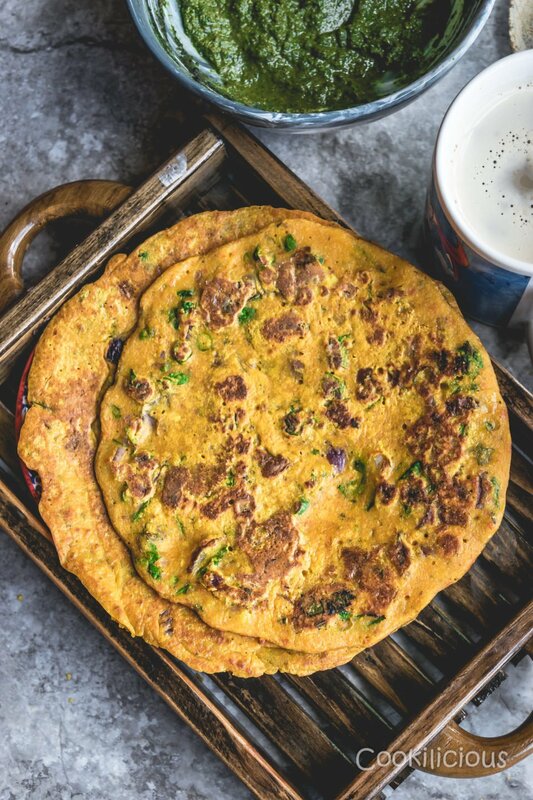 This instant Indian frittata is made with chickpea flour and tomato. Tomato omelette has played a significant part during my childhood, thanks to my Popsey (Dad). This was the first dish I saw my dad cooking for us. Although he would cook occasionally as my mom did all the cooking, he was a man of great taste and enjoyed his food. His cooking style was different to mom’s and he loved experimenting with recipes more than mom. He was more well-traveled than her and had tasted different cuisines to have developed his likes and dislikes. My mom’s cooking style was more traditional although she had adapted very well to the fast pace city lifestyle and its food. I think I am lucky to have gotten traits from both of them. They both had their own approach when it came to cooking and my brother and I benefited from it the most. We loved our mom’s everyday cooking and also looked forward to the day our dad would cook. My dad would leave the basic cooking for my mom to do and he would come in kitchen only to prepare something different for us. He was the one who first introduced the Bombay style French Toast to us and of course his most prized creation – the Tomato omelette! We are vegetarians and as a child, never eaten an egg. I would see my neighbor friends eat omelette made of egg and come home and pester my mom to make the same for me. She then explained to me that we being vegetarians, we do not consume eggs. That is when my dad came up with this genius recipe. He would market his dish as a meal for vegetarians and since it had the word ‘omelette’ in it, I was happy to eat it. However, over the years, we started consuming eggs occasionally and that too because of him. He felt that we needed to include that in our diet and he would make it for us while my mom would not even enter the kitchen when it was being made. She even made him use a different pan and spatula for cooking the eggs! 🙂 Lol! on all sides. Cook both sides evenly it for 2-3 minutes on medium flame.
. The tomatoes give this dish a certain tanginess that is required and the green chillies lend spice to the dish. Truly a mouth-watering meal that can be enjoyed for breakfast or as a light snack. You can prepare the batter in advance and then prepare the omelette as and when required. It’s especially convenient when kids come home hungry from school or you are too busy in the mornings to cook up an elaborate meal or even pack it in lunch boxes. A very versatile dish that’s dairy and gluten-free. In India, these are served in a club sandwich which makes it even more delicious. Its served this way at restaurants and as street food and I have enjoyed this club sandwich many times over the years. 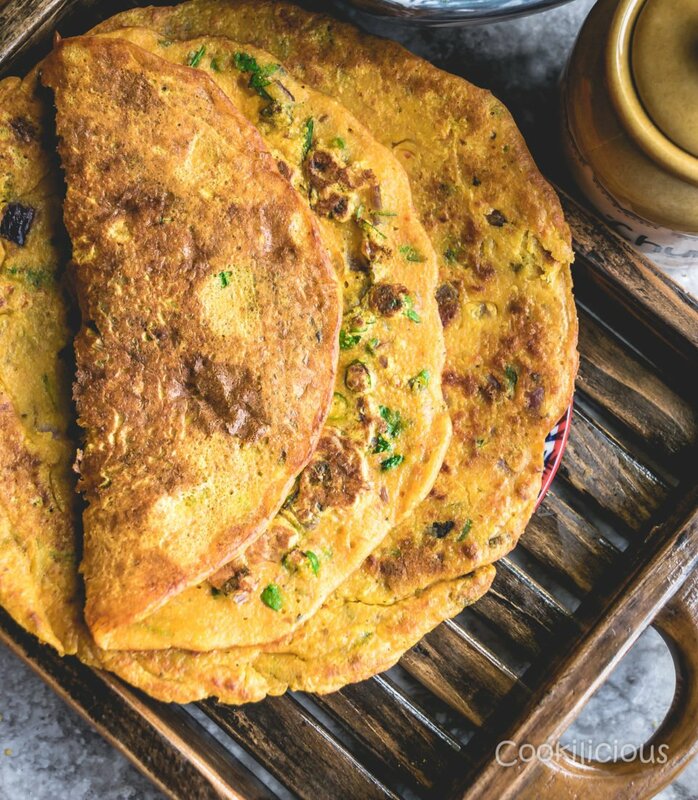 You must give this recipe a try when you visit Bombay next time. 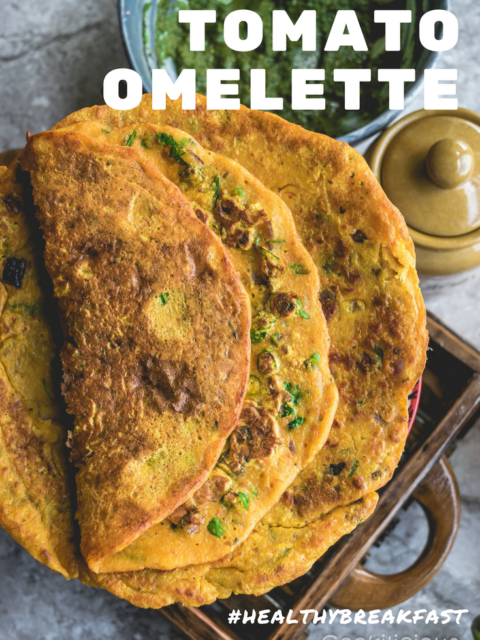 Tomato Omelette is a popular Indian breakfast. It's healthy, eggless, vegan and gluten free. 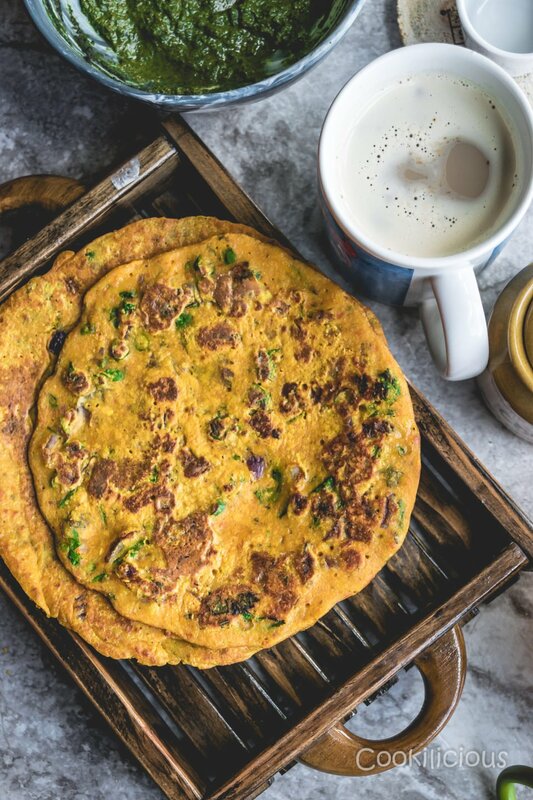 This instant Indian frittata is made with chickpea flour and tomato. In a mixing bowl add chickpea flour, all purpose flour and semolina. Then add turmeric powder, coriander cumin powder, chopped onions, minced green chillies, chopped cilantro and salt. Make a puree of tomatoes and add it to this mixing bowl. Mix and give it a pancake batter consistency by adding enough water. Heat a pancake pan and pour a spoonful of batter over it. Sprinkle grated mozzarella cheese (this is my addition) and drizzle oil on all sides. Cook both sides evenly it for 2-3 minutes on medium flame. Instant tomato omelette is ready. 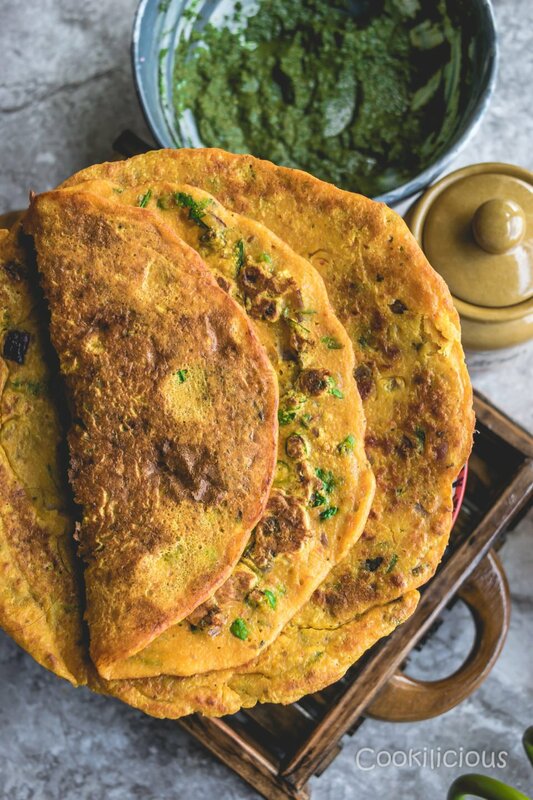 My dad would serve it with toasted bread (similar to how an egg omelette is served) but I prefer to enjoy it with some green chutney or ketchup. Need some more similar breakfast ideas? 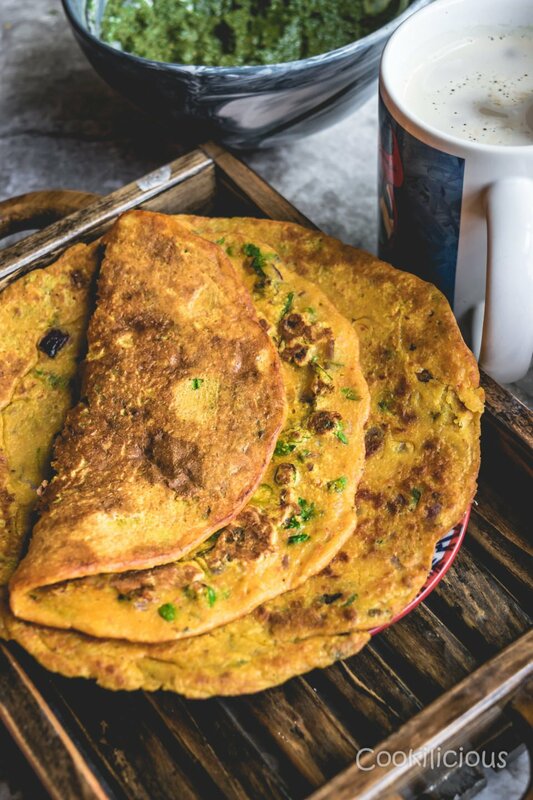 Try these – Healthy Oats & Veggie Mini Pancakes, Savory Chickpea Flour & Mushroom Pancakes, Quinoa Paneer Mini Pancakes, Cheesy Corn Rawa Pancakes, Gluten Free Mint Flavored Potato Bajra Pancake, Korean Pancakes/Pajeon, Chinese Scallion Pancake, Broccoli Oats Chilla/Pancakes, Healthy Oats & Veggie Pancakes and Potato Dosa.